CPM or “Critical Path Method” scheduling is a management technique used to plan and control a project by combining all relevant information into a single plan defining the sequence and duration of operations and depicting the interrelationships of the work elements required to complete the project. Your CPM schedule will identify the project’s critical path. The critical path is the longest sequence of activities in a network, which establishes the minimum length of time for accomplishing the end event of the project. It is the critical path that determines the project’s completion time. A delay to the critical path will delay the project. Baseline revisions are often required when changed conditions cause the original baseline to no longer represent a reasonable or feasible plan for construction. TCO Management is a specialty service of preparing the building systems for successful testing and inspection. In construction scheduling, a Gantt Chart or Bar Chart is a graphical representation of durations of activities against the progression of time. The Gantt Chart is the most familiar of CPM schedules. In relation to the critical path, float is the value of time that the start or finish of an activity can be delayed without affecting the project completion date. Cost Loading is the process wherein costs are assigned to activities in your schedule in order to determine the value of the work in place, or earned value, when it is time for a payment requisition. Additionally, cost loading will allow Nova to generate cash flow predictions so you can provide the Owner with estimated monthly cash requirements for the entire project. Building Commissioning is a technical and systematic process that addresses communication, coordination, testing, verification, and reporting to ensure that the HVAC system, through interface with the plumbing and fire alarm systems, is performing as intended. The Network Analysis Schedule or NAS is a scheduling plan which takes the projected construction activities, and considers their logical order & the sequences in which they should be performed. These relationships are shown graphically on the Network Analysis Schedule as a diagram which becomes the mathematical model for the project. A baseline schedule is the accepted, planned CPM schedule of activities showing the entire work prior to construction. This baseline then acts as a snapshot or target against which you can track your project’s actual progress. Earned Value Management (EVM) is a technique used for measuring project performance according to planned and actual costs and progress. This technique compares the planned cost of the work to the actual cost of the work complete, ultimately determining your earned value. Retro-Commissioning is a more systematic approach to commissioning existing buildings and includes investigating and analyzing the existing building systems, optimizing performance and improving operation and maintenance. 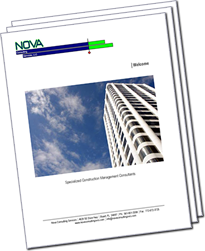 Learn why Nova Consulting is the right choice.